This is the third part of my electromagnetic pulse series (see Part One and Part Two). By now, I've covered the hardware and general concept of electromagnetic pulse generators, but how exactly do they disable electronics? How can an invisible field of energy have such a catastrophic effect on computers, cell phones, and most any other electronics? I'll be answering all these questions in part three of Making Electromagnetic Weapons. 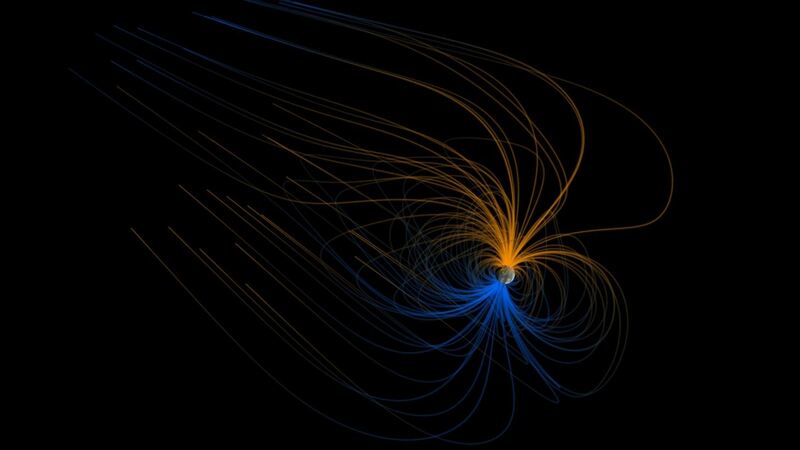 A conceptual photo of the Earth's magnetic field. If you're not familiar with electrons, copper coils, and generating voltage with a fluctuating magnetic field, don't worry, I'll go into these concepts in this section. For the sake of example and metaphor, let's say electrons "live" in conductive wire. When a magnetic field passes by the wire, it excites the electrons and they begin to move. Once the field stops moving, so do the electrons. This concept is the primary way we generate electricity; using coils of wire and powerful magnets. If you've ever seen those "shake" flashlights, the little silver cylinder that's being shaken is actually a powerful magnet moving past a coil of copper wire, exciting electrons. An EMP generator follows the same concept; a high current pulse of electricity is released through a single or double loop wire antenna, creating an intense magnetic field that, in turn, excites electrons in any metal in the range of the magnetic field. This creates a large voltage surge in the surrounding electronic components, and effectively fries any sensitive transistors, ICs, etc. There are two ways an EMP generator can create a magnetic field; either by a very powerful single-pole pulse, or a less powerful fluctuating-pole pulse. Both have their advantages and disadvantages. For example, a single pulse EMP takes much more current than a flux-EMP, but has a larger range and less components. 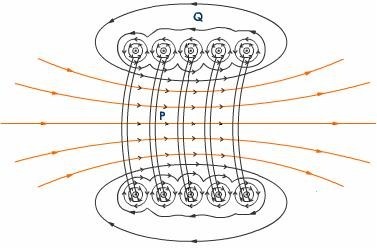 Since in a flux-EMP there must be an alternating (fluctuating) magnetic field, it requires power transistors to switch the current's polarity through the coil, and also hall effect sensors (magnetic field sensors) as well as an IC. In the past two articles, I've been focusing on the first method, the high current single pole pulse method, since it is the simplest concept and relatively easy to build. Also, if misused, flux-EMPs can cause catastrophic widespread damage to electronics, even if only wiping local flash and drive memory. Through multiple experiments, I've found that a simple single-pole EMP can easily wipe the local flash memory of any device up to three feet, and render any electronics permanently useless from about an inch. Keep in mind, this is the simplest of possible designs, consisting of three single-loop antennas, a couple capacitors, a switch, and a transformer. Ideally, focusing the magnetic field into a beam-like shape would work the best, but magnetic fields are very difficult to work with. However, it is quite possible to create a short focus field, and that is exactly how a simple single-pole EMP functions, rather like a solenoid. They key is parallel coils that "drag" the field through a "tube", and spew them out the other side before looping back around to the opposite pole. As seen in the photo above, the red lines represent the "squished" magnetic field as it moves through the coils of wire. The circular black ovals (with arrows) represent the looping field, as it returns to the opposite pole. This field as the potential to excite electrons in any conductive metal within the field, and the strength of the pulse (field) determines just how excited they become. 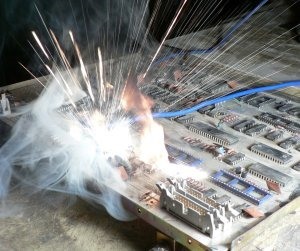 To put it simply, the more the electrons move, the higher the voltage spike inside the surrounding electronic circuits, and the higher the voltage spike, the more damage done. Next in the series, Making Electromagnetic Weapons: Directed Microwave Energy. Stay tuned! If you're interested in other articles involving high voltage, magnetic pulses and weapons, check out How to Make a Coil Gun and Chained Lightning: The Jacob's Ladder. EMP generators of all kinds require high voltage and current! This is LETHAL! The current and voltage used in these projects literally will fry you to a crisp! DO NOT misuse, abuse, or take electricity lightly! Be careful with electromagnetic pulses! They can easily wipe and/or destroy electronics! Before testing, remove any circuitry from the room! I am not responsible for any damage, harm, or widespread destruction you cause! Well, the explosive EMP simply uses a directed explosion to "force" the magnetic field in a linear direction. The flux-pole pulse simply modulates the general magnetic field to have a greater effect on electrons in surrounding conductive material. Ohhh.... Now I get the difference. Makes total sense that the explosives in that one would force the pulse and that's it. Thanks. Chris is one smart kid, for real. "If you're interested in other articles involving high voltage, magnetic pulses and weapons, check out How to Make a Coil Gun and Chained Lightning: The Jacob's Ladder." WIN. WIN. WIN. As well as the smell of napalm in the morning, right? Even more better. Who is this genius? He has, what, electromagentic napalm? I do not mostly understand. what is the purpose of the transistor in a emp device? is it possible to shoot a emp charge through a ring/chamber of ionized gas /plasma to form some sort of projectile? Please explain if this is an idea that can be adapted for creating a much smaller application. Is the use of a capacitor or transformer really required? For a much smaller appliction?